Well N scale had one so it's only fair for HO and other scales to have an area to post daily work on your layout and rolling stock. I will start with my Tsugawa HO Level Crossing. A neat kit but it would have been nice if they molded the parts in yellow plastic. It is very easy to add black over yellow but it took me 4 days to cover the molded black plastic with yellow. One coat of primer and 3 coats of yellow later I was ready for my black stripes, the stripes aren't perfect and a bit oversized but they look good enough to me. If I get really adventurous I might drill out the lights and add LEDs but that will be a project down the road after I start an HO module to install these on. After hours of youtube videos on Japanese crossings pretty much anything you can think of is prototypical but I wanted to paint mine like most of the generic crossings. Hmm, somehow my gallery went to private...it should work now changed it back to public. Strictly speaking I didn't work on the layout, but I did do some measuring and planning using the Kitchenbenchbahn. I wanted to get an idea of how a four-car EMU would look on a layout with a 10' length of track. And while I had the track down I took some photos of my recent additions to the fleet. I hate your photos mark! They always make me want to do very irresponsible things with my wallet. What wonderful models. I am so green with envy! 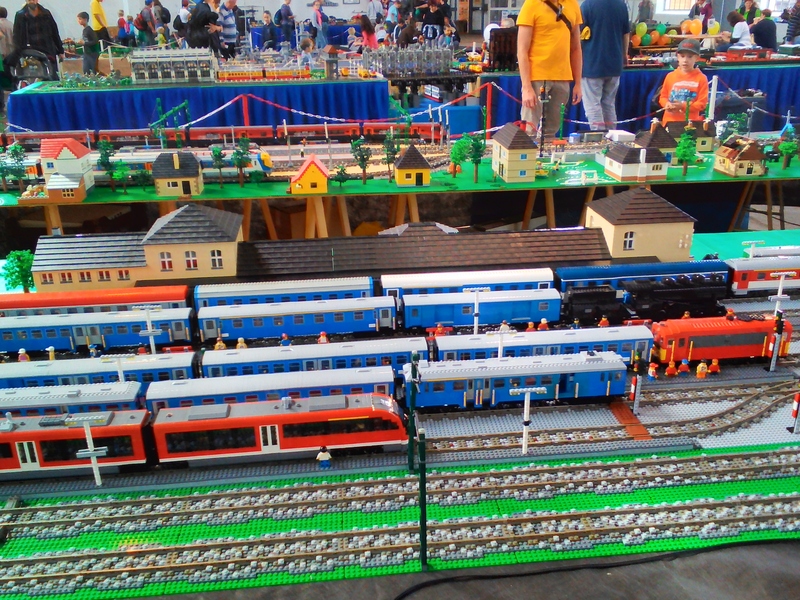 Not H0 or N scale and not even japanese, but there is an exhibition right now at the Budapest railway historical park and i was invited. It depends on the individual model. Some have the handrails, grabs and other fiddly bits already installed, other you have to do yourself. The Tramway diesel cars have some parts already attached, and I have to do the rest. That's okay, I'm happy to have models with such good detail, so I don't mind doing it myself. This is an older brass model of a C50 made by Toby. When I looked at it closely I could see it hadn't been well cared for, and being an older model it has an open-frame motor without a gearbox. So I assumed it would need repowering. But I wasn't too concerned about that, there's no shortage of aftermarket motors and gearboxes available. Some years back I was at an exhibition and didn't buy a KTM C50 that was for sale there, and I've always regretted it. So I did buy this one. The really interesting part came when I got home. I gave her a quick test run on the Kitchenbenchbahn, and to my surprise the loco not only ran, but ran very smoothly and quietly. After a clean and some careful oiling it runs even better. So I'm not going to bother replacing the mechanism for the moment. The loco needs some minor repairs and the paint needs a touch-up in places, but all in all I'm very happy with my latest addition to the roster. What a beautiful engine, it looks like its in pretty good shape to me! I wish kato would come out with a C50 in N.
I thought they just did? What a beautiful engine, it looks like its in pretty good shape to me! Before I took this photo I'd straightened numerous bent parts and generally tidied it up. I've since replaced the missing cab handrail and touched up the paint where it was chipped or scratched. Next is a light application of weathering. Having mostly finished doing the boring bit - making the base for the Mitaki layout - I spent a bit of time today placing track, trains and structures so I could visualise how it's all going to look. The platform will be long enough to accomodate four cars, the short section shown here is just to establish how wide it needs to be. A few European buildings are standing in for more typically Japanese apartment buildings, again so I can establish the width of the street behind the station. Early days yet, but I think the concept will work. In one sense it's just a bigger and better "plank" than my previous effort, but one that can be taken to an exhibition and have running trains on it. At the moment it's just sitting on sawhorses in my shed so I can do the messy work on it, but it will eventually have integral legs with castoring wheels on one end so it can be easily moved. I finished building the base for the Mitaki scenic module. It now has diagonal braces to prevent twisting, attachment points for the legs, and a power bus for the track and building lights. Next thing to do is prime it and paint it. Once that's done I can start tracklaying. Another unfinished project, resurrected from the depths of the storage box - a kitbash of an old Walthers kit for an Airslide covered hopper into a "near-enough" JNR ホキ3100 cement hopper. I can't do any work on the layout right now so I thought I'd finish this one instead. Two more unfinished projects retrieved from the storage box. One is a Taki7900, based on an Atlas model of a US tank car, and the other is a Seki1000 from a HobbyModel Seki3000. The beautifully detailed archbar trucks on it are from Orient Express Model Railways in Adelaide. 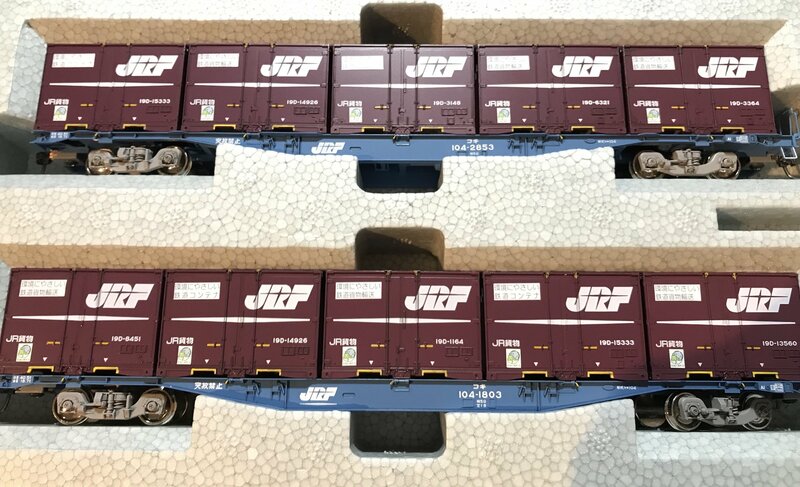 Last night's project - numbering and detailing my Kato キハ65 railcars. Nice! These are amongst my favourite JNR diesels. Do you also a KiHa 58 to accompany the KiHa 65? I do not think I have ever seen two KiHa 65s running together without a KiHa 58 attached to it. Nice work Mark. I still need a quiet moment without toddlers to number mine as well as numbering a load of Takis and Kokis. Do you add a layer of clear coat over yours? I wondered how well these dry transfers hold up in the case of imprecise handling. This weekend, being a 3 day weekend thanks to Ocean day, I managed to secure a bit of time to pin wash my Kato Koki 104s and the odd Tomix 106 as well as add container details and wagon numbers. I used a mix of Tamiya Enamel black with Tamiya enamel thinner. About 5 parts thinner to 1 part paint. This way I could build up greater tone with a few more applications as needed. Still need to get a compressor so I can airbrush more muck to the side and top but this gives a nice starting point. 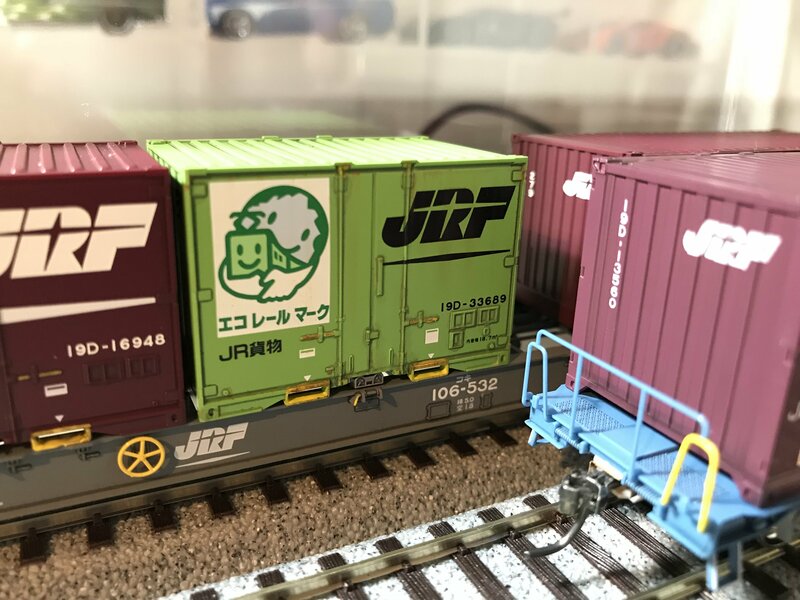 I also added some hazard yellow to the handbrake side of the railings on the Kokis and the forklift points on the containers as I’ve noticed this on the real thing. Yes, I've got a small fleet of 58s and 28s to go with the 65s. But I do have photos of 65s running on their own in two of the Yamakei colour books.